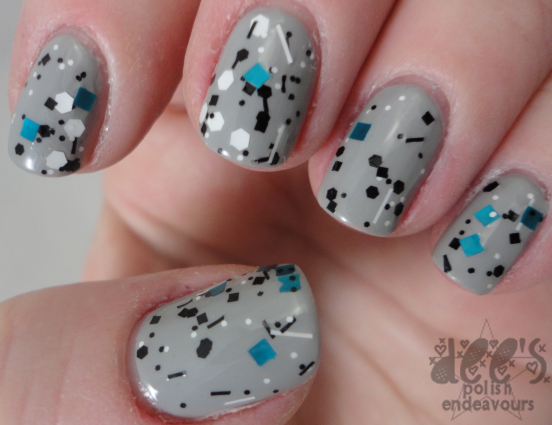 Today I bring you two polish that I am insanely excited to share! Plus x 2: I think this pairing is brilliant and the names of these polish are genius! Again, I apologize for the dry shape of my mitts. Stupid *insert whatever I am lacking in my life*. Anyways, this was three coats of Zoya Dove (which was sent in my Private Pumpkin exchange from the wonderful Silver) and a single coat of I (heart) NP Fully Turqued. Love this combo. Though I feel an orange or a pink will be my next base with Fully Turqued. Yeah, it will be magical! See you all later.. and.. Let's Get Weird!!! Cute mani, and yes, that would look amazing with an orange base! Fully Turqued is amazeballs. I'll never be done lemming. ;p Also can't wait to see it with orange. --0a burnt orange would be really rad. Thanks for showing! Love it! Love the color combos and the glitters on it. Great pick! Love it!